As many of you know and have noticed, I'm a HUGE candle lover and collector. I find that the more candles I have, the more relaxed I feel. As I write this, I have a candle currently on in front of me, and some wax on in the living room. So once Witch Baby Soap showcased a giveaway with Mythos Candles, I immediately stalked the account and website. What I didn't realize was that the brand was much more than just meets the eye. 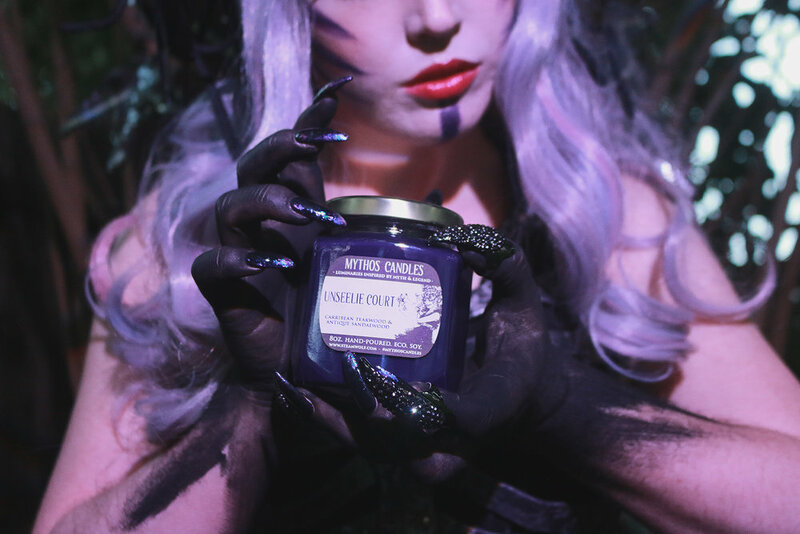 I'm introducing this post as an interview with Steamwolf Symphony, because Mythos Candles is a brand within Steamwolf Symphony, but I'm glad I'm doing it that way, because now you get to meet the person behind the brand in general. Candace was also so kind to send photos of her latest shoot, in which it demonstrates not only both her brands, but her amazing talent as a photographer! Without further ado, let's get to know this badass lady! Upon looking at Steamwolf Symphony, you can see mythicality and whimsical inspo all throughout, how does this explain you as a person? I've always been interested in both fantasy lore and horror stories. That being said, I tend to lean a little bit more on the darker side of whimsy. As a kid, I grew up on films like the Dark Crystal and Beetlejuice. So to be able to translate my love of those things into a candle line has been a dream com true. You have a wide range of products you hand make, how do these individually come to be? Each of my headdress pieces are one of a kind. Materials are sourced from all over the place, even when I am at flea markets I am always looking for new things to work with. All of my ears and horns are sculpted, molded and cast. My candles are hand poured in small batches straight from my kitchen. Most everything in my store is handmade by me with the exception of some artist pieces I am starting to carry in my store. If one of the items you create could explain you as an individual, what piece would it be and why? I'd have to say that of all the things I make, my headdresses are my primary passion. Being able to express myself through an individual piece is pretty liberating and knowing that the pieces go to people who cherish them, just makes me feel good. I get to process various moods/feelings when creating different pieces, so it's a really nice exploration of self. Do you find it hard to maintain an audience with social media slowly stopping brands from growing? Yes, it's becoming harder and harder to become anything on social media. Thankfully I've been evolving the way I run my business through them. I do collaborations with models, designers, makeup artists and in the end it draws more eyes to my work as a whole. Not many makers or people for that matter, take it upon themselves to recycle and re-purpose pieces from animals. Can you explain why you chose to go this route with some of your items (headdresses)? It's a touchy complicated subject for a lot of makers. I'm an animal lover, but I also understand the balance or nature and believe every part of the animal should be used. Which is why when I source animal parts, I do so with that respect in mind. I source pieces that are antiques, vintage and eco-friendly, where I know 100% that the entire animal will be used. A lot of Pagans use these specific pieces in rituals. Some people like these pieces because they are more authentic to their costume garb. I've even made a real antler headdress for my wedding this year, so it's usually specialty reasons why I do it. Working with animal parts is more challenging, it's much more interesting to me than the faux stuff. To me it offers more respect to the animal than to just have it sitting in someones storage or hung on a wall. I do however have options in my store that are 100% vegan/animal friendly materials, which I tend to make more often than not. Prior to Steamwolf Symphony, what was your career and how did it get you here? I was a social media marketing and PR person in the video game industry for over 10 years. I actually quit my job to pursue more freelance work while I got my business off the ground. Sometimes I miss it, but I don't miss not being able to set my own hours or working in a cubicle all day. Let's get more comfortable, if someone was to narrate your life, who would you choose? Kristen Bell, she's a goddess and I connect with her on a spiritual level. What movie, book or song quotes, do you use frequently? Two things keep me on my feet regularly: Invictus a poem by William Ernest Henley and the film Practical Magic. What are some of your favorite charities and which would you want to work with? I have worked with both Operation Supply Drop, a gaming charity that sends care packages to active military people all over the world and 25% of my Fairy Steed candle proceeds actually go to Queens Best Stumpy Dog Rescue. I'd really like to work with more wildlife rescues in the future. What TV show character would you want to play, if given the chance? It's hard to narrow it down, but if I had to choose one I'd probably have to say Dana Scully. What tips and tricks have you picked up throughout your experience, and what advice do you recommend? Running a business is hard work, anyone that says otherwise has never run their own business. I work long hours and manage a household so one of the best things I've learned is to take some "me" time and focus on self care. It's extremely important to do that so you don't burn yourself out. It's something I've had to learn the hard way over the years. I never stop learning, everyday is a new adventure. What's your, 'Back in the day we....'? Are there any products you are currently working on, that you haven't been able to pin down? Actually, I am working on something! My Mythos Candles summer collection has been something that's been in the works since last year. I am about 60% done with the planning, but it's still a work in progress. It's going to be "Into the Laybrinth" with a two candle release. What could we expect in the next coming months from the brand? Hopefully, I'll be releasing tealight candle packs, more tin candle sets and my stand alone fragrances in tins. Plus I am planning to offer a Mythos/SteamWolf quarterly subscription box through my Patreon (linked). I want to thank Candace for being a part of this series and for talking about a topic that so often, people ignore or don't like discussing. I currently have the Krampus candle and it smells AMAZING! What's on your shopping list? Lastly, if you could request a collection from Candace, what would you request?